Students from different colleges at UM were asked to nominate their favorite professors. They made their selections based on the impact the professors have had on their lives, both inside and outside the classroom. Each professor featured has proved that they’re more than just instructors – they help promote life-long learning and demonstrate a love for their field. 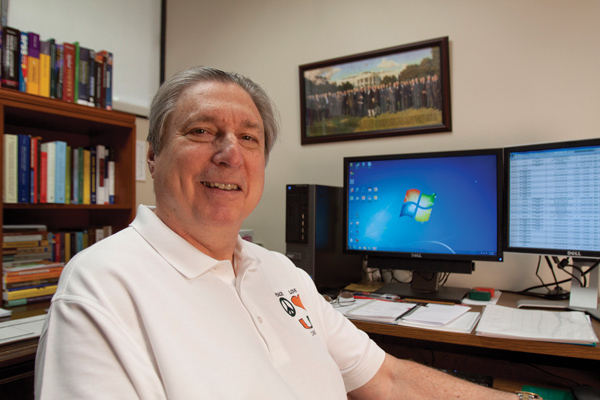 Political science lecturer Arthur Simon has one goal in mind when he enters the classroom: that his class be the best class his students experience in their entire undergraduate careers. “When I prepare for class, I think about my time as a student, and what I would want to learn,” he said. In trying to design “the best class in college,” Simon prepares lectures that will be perceived as memorable and engaging. He said that while teaching his evening classes, students will not notice the time and often forget that class ends at 9 p.m.
A UM undergraduate and law alumnus, Simon has worked as a full-time attorney, a state legislator, and a lobbyist. He is also a member of the Iron Arrow Honor Society. His courses range from administrative law for prospective law students, to statistical methods in political science. “Teaching at UM is an opportunity to help younger people realize what I realized when I was a student here,” Simon said. He also serves as a first-year student adviser for political science majors and guides students who are thinking about a career in law after graduation. Simon also has a fun side. He is the adviser for KAOS, the only co-ed hip-hop dance group on campus. 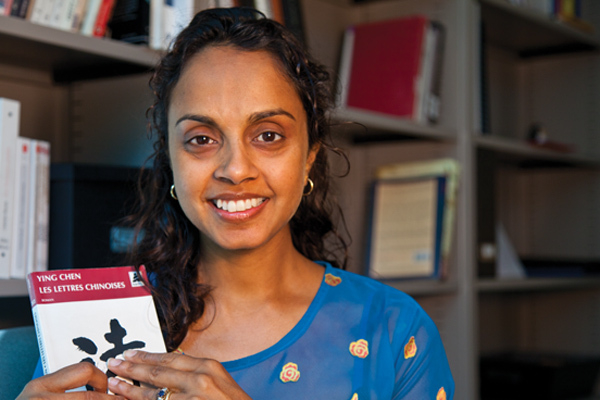 For students in assistant professor Subha Xavier’s classes, French has become a gateway to understanding culture and connecting the language to the greater world. “I try to bring literature from the French-speaking world alive by showing how it applies to every student,” said Xavier, who helps make the language relevant by connecting the texts to students’ daily lives. She started a course blog in one of her classes so that students can share how they interact with the language outside of the classroom. Two students in her class, for example, wrote about French DJs that performed at the Ultra Music Festival. Students also appreciate the attention and challenge that Xavier instills in her courses. “I had never taken a French class, or any class really for that matter, where the teacher cared so much about the quality of my writing and participation,” sophomore Kimberly Thompson said. Xavier teaches courses on immigration, French literature and culture, and African literature and film. She herself immigrated from Sri Lanka to Canada, and discovered French there. Xavier has noticed that a decline in interest in French beyond the intermediate level has occurred due to the current economic climate and students’ concern about working toward a secure career. She does emphasize, however, that a foundation in French will create opportunities in all disciplines. PowerPoints and other typical classroom technologies don’t suit professor Jennifer Langer-Osuna’s style of teaching. Langer-Osuna is an assistant professor of teaching and learning. Rather than rely on these technologies, Langer-Osuna uses a discussion-based teaching style in her math education courses. She hopes her students will teach with similar methods in the future. “It’s about creating classrooms that pose an interesting problem and let the students figure it out through discussion,” she said. Her style of teaching also comes from the philosophy that each student has a voice and can contribute in math classrooms. “It’s about discovering their voices in a safe space to reach those ‘a-ha’ moments,” she said. Graduate student Edwing Medina finds this method conducive to learning. “Langer-Osuna is completely focused on individualizing our in-class experience while helping us develop as professionals,” Medina said. Langer-Osuna believes that future teachers need to develop more experiences that expose students to innovation. She hopes that future teachers learn to become advocates for education and take a community-oriented approach to solve problems in education. Wesley Smith reminds students to lead healthy lifestyles long after they leave his advanced nutrition classroom. Senior David Thompson remembers receiving an email from Smith a month after he completed his summer course, detailing the importance of drinking beet juice. “I was surprised that he thought of me enough to send me that email,” said Thompson, who has taken four different classes taught by Smith. Smith serves as the undergraduate program director for exercise physiology, and teaches courses including bioenergetics. He is also a clinical assistant professor. “Since lifestyle factors are the most important at combatting chronic disease, it is pretty easy for students to see the practicality,” Smith said. He follows a philosophy of “edutainment,” a combination of enthusiasm and humorous anecdotes included in his lectures. He believes this technique helps make the material more interesting. “I think the three keys are preparation, enthusiasm and humor,” Smith said. He also works to clarify complicated concepts so students truly gain understanding. “Everything I learned in his class I could apply to myself for the rest of my life,” Thompson said. When physics professor Neil Johnson heads to class, he always ask himself – would I walk out of today’s class? Johnson teaches PHY101, the introductory course to college physics, which has more than 140 students enrolled. He previously taught at Oxford University in the United Kingdom for over a decade. He describes his class as being “simultaneously both very hard and very simple at the same time. ” The scope of the introductory class is broad but the textbook is written in a complicated way. Junior Sheikh Ali still remembers when chemistry professor Carl Hoff demonstrated combustion in class. Hoff brought a corked glass vessel, filled with it with oxygen and sparked it. Hoff channels his passion for chemistry whenever he steps into a classroom. Ali credits for Hoff for fostering his own love for chemistry. 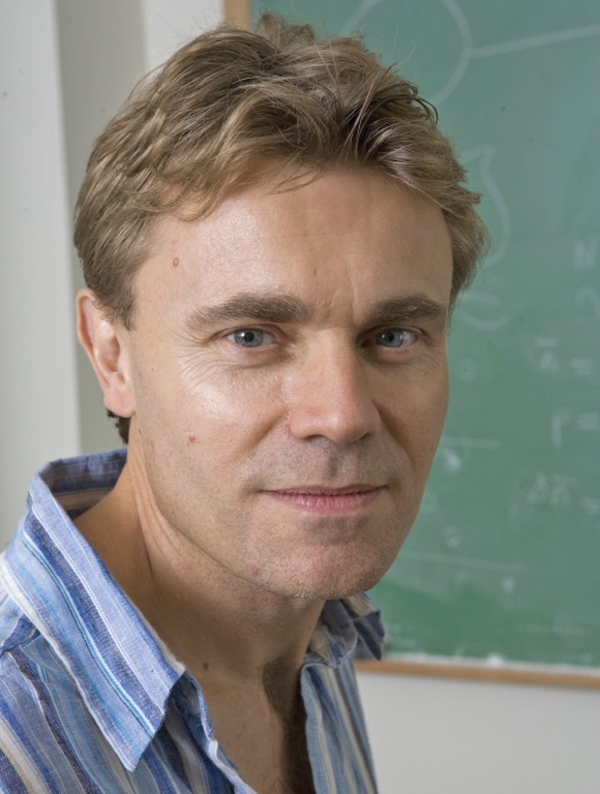 Hoff acknowledges that “chemistry can be painful to think about if you are not interested in the nature of the physical world,” but hopes to instill some knowledge in his students. Political science lecturer Bradford McGuinn is known for helping student navigate the complex relations between the federal government and the Middle East. McGuinn’s courses focus on the politics of international relations, especially those pertaning to groups of people in troubled places, from Africa to the Middle East and South Asia. “I think it is important to honor the complexity and the humanity of the many people caught in places’ conflicts and pain,” he said. But McGuinn’s favorite moments in the classroom include listening to creative comments and watching the growth of students he has had over several semesters. Something that separates McGuinn from other political science professors is that he lectures to groups within the United States military. Whether he works secretly for the government or not, as the rumor goes, students continue to take his courses because of his interesting and relevant lectures. Helping treat children with autism and adults with schizophrenia are some of the goals for associate professor and program director for music therapy Shannon de l’Etoile. As a board-certified music therapist for a variety of clinical populations, de l’Etoile teaches students to practice music therapy by keeping the clients and their particular conditions in mind. “My hope is that students eventually become successful therapists,” she said. Her teaching philosophy relies less on memorization but rather on the development of critical thinking that is needed for such a career. Students like senior David Cruz, who has taken three courses with de l’Etoile and is one of her advisees, finds her courses to be rewarding. “She always tells us, ‘Don’t study for your test, study for your life,’” he said. In order to keep up with the latest developments in music therapy, de l’Etoile updates her teaching materials to incorporate recent research findings and how advanced technologies will help visualize how the brain reacts to music. “With this understanding, we can better use music to produce functional outcomes for patients, such as improvements in memory, language, movement and emotion,” she said. Outside of the classroom, de l’Etoile is a member of the American Music Therapy Association (AMTA), is recognized as a Fellow of the Robert F. Unkefer Academy of Neurologic Music Therapy and serves on the editorial review boards for the Journal of Music Therapy and for Music Therapy Perspectives. Even though Frost School of Music professor Carlos Rivera is a professor in the Bruce Hornsby Creative American Music program, he wants his students to learn much more than just how to make music. Rivera is a self-proclaimed “music geek” and hopes to share a little bit of his enthusiasm with his students. “I had teachers who were incompetent or jaded, so that is the last thing I want to do,” he said. In his classes, Rivera spends most of the semester analyzing contemporary music and Top 40 hits. Only in April has he begun introducing his students to the works of classical legends like Wolfgang Amadeus Mozart. One of the classes Rivera teaches is an experiential learning class in which students perform pieces of their own selection and receive feedback from Rivera. Through this class, Rivera has had his students organize performances for the community, doing everything from creating the set list to attracting an audience. “In the real world, it’s tough, so I try to bring in a little bit of that real world approach,” he said.